You can trust that we can handle any commercial roof repair job in Newmarket. When you have a commercial building, it’s important to maintain all exterior components to keep it in good shape. If you have a broken window, damaged door, or cracked exterior wall, you would likely fix it right away to prevent theft, damage from the elements, and other issues. But many commercial building owners don’t react as quickly to problems with the roof. A damaged roof can lead to a lot of issues, including flooding and other water damage, intrusion by pests and animals, and mold growth. So instead of waiting for these problems to start, it’s best to bring in a professional who can handle commercial roof repair. At Slippery Slope Roofing, we specialize in commercial roof repair and understand the major differences in this process when compared to residential roofing maintenance and repair. 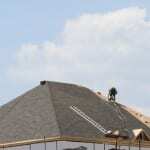 Commercial roofs are typically larger than the roof on a home, so the job is much larger and takes more time and work. A commercial building may also house extremely valuable items, such as medical equipment, tools, computers, and other things, so keeping the seal on the top of the structure is crucial to prevent major losses for the company. Our commercial roof repair services are available in Newmarket, Ontario and many of the surrounding cities. We have experienced and skilled technicians who work under a foreman who has been in the business for years, so you can trust that we can handle any job that needs to be done. Whether you need repair on a small commercial structure or a massive warehouse, we will get the work done efficiently from start to finish. At Slippery Slope Roofing, we offer high-quality commercial roof repair services in Newmarket, Barrie, Orillia, Bradford, Alliston, Midhurst, Cookstown, Beeton, Innisfil, Angus, Collingwood, Wasaga Beach, Oro-Medonte, Midland, New Tecumseth, Clearview, Bradford, Essa, Stayner, Springwater, and surrounding areas of Ontario.